Bangalore: Strengthening its resolve to make world-class eye care facilities accessible for one and all, Dr. Agarwal’ s Eye Hospital announced their aggressive expansion plans. The announcement was marked by Dr. Agarwal’s Eye Hospital launching their new state-of-the-art centre at Whitefield. 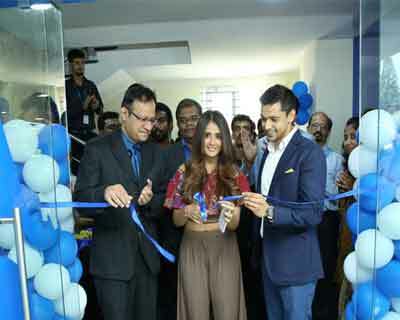 The new facility was inaugurated by the popular actress Parul Yadav in the presence of Dr. Adil Agarwal- CEO, Dr. Agarwal’s Group of Eye Hospitals, Mr. S Rajagopalan, Managing Director, Dr. Agarwal’s Group of Eye Hospitals and Dr. Amod Nayak- Medical Director, Dr.Agarwal’s Eye Hospital, Whitefield. The event witnessed the actress extending her support towards Dr. Agarwal’s Eye Hospital’s eye donation campaign by pledging her eyes. The launch was also marked by Dr. Agarwal’s Eye Hospital flagging off a Bike Rally to create awareness about eye donation. As part of the initiative, the bikers will travel across Whitefield creating awareness on the need for eye donation. Situated at 381, 1-st cross, Narayanappa Garden, Whitefield, the new centre is of around 8000 sq. ft super specialty eye hospital will address the growing need of the residents of Whitefield to have world-class comprehensive eye care facility in the area. Apart from common eye ailments like Cataract and Refractive Errors the new super specialty eye care centre offers treatments for diseases such as Glaucoma, Diabetic Retinopathy, Macular degeneration, Squint, Cornea conditions, Cosmetic Oculoplasty, UVEA and Pediatric Care. Equipped with the latest operation facilities (Modular Operation Theatre, Precision Cataract and Retina Operation Theatres) the centre will provide patients with the best in surgical care as well. The hospital also has facilities like laboratory, pharmacy and optical wing that offer wide range of frames and lenses of high quality and leading brands.